Well, here I am blogging from the beautiful and fastinating abbey of the fontevraud order . 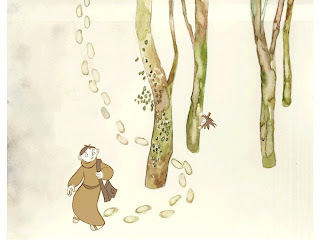 Tommorow we will have screening in the old monks refectory. I just had dinner with Jean Paul from Les Armateurs and Xavier, our host. Xavier is an expert on both animated films , especially Japanese ones and also Mediaeval art. He saw the presentation Ross Stewart and I gave in Annecy and asked Gebeka the French distributors abouta screening here. I am in great company actually, since Michel Ocelot as well as several Japanese and European animation directors have presented their projects here in the past. The buildings are very impressive , sort of Romanesque a bit like Mellifont Abbey in Ireland, but on a much grander scale. Apparently Richard the Lionheart is buried here so we have some good mediaeval company too. Today was spent doing interviews with journalists for papers, magazines and tv as well as some internet sites. It was interesting, as the French journalists are very like the Belgian ones , they have very intelligent and interesting questions , very "film theory" type things. Its great how many people catch all the levels of visual symbolism we tried to work into the film and appreciate the research we put into it. The days are starting to blur , we will have the screening tommorow and then go to Angouleme for another one. I am told an illuminator will be at the screening tommorow in the Abbey! I got a hold at last of the first comic book all printed and shiny! It looks great and its very gratifying to have a real "BD" in my hands after all these years! I think its cool to have the little prequel story at the start as a bonus, and it does seem to read well going from the last page of the prequel straight into the goose chase which is the second sequence of the movie. The prequel sort of takes the place of the prologue part in the movie. Anyway, I also recieved the Cd of the soundtrack which is beautifully produced with the illumination that Lily Bernard made to show Brendans "first attempt" as the decoration on the actual Cd. There is a nice leaflet inside with some of the scene illustrations and so on. I also had a look at some of the promo material that Gebeka have prepared for schools . it really nicely produced stuff, I'm building up a great collection of souvenors! Anyway I'll stop blabbing now, we are recievings oem beautiful compositing from Digital Graphics for the Song of the Sea trailer these days and I am trying to keep up with that stuff between everything else! Poor Fabs is getting his baptism of fire as AD right now as my point of contact on stuff while I'm away! So its still very busy on many fronts. I had to post this funny conversation from the Jameson Dublin Film Festival blog - this must have been Pauly in the jacks ! I think I may have the winner of the best “Overheard at the Festival” remark already. This was overheard by me in the men’s room at the Festival Launch Party in the Odeon Bar on Monday. Man 1: Last time we spoke you were working on some cartoon. How did that work out for you? Man 2: Not bad, it’s the closing film of the Festival. Our premiere has been announced! The Gala screening at the close of the JDIFF on the 22nd February. Hope its a great night for all! this is by far the swankiest hotel i've ever stayed in! jacuzzi, chandeliers, all that fancy smancy stuff. but it was lovely to meet Marie Laure and Frits tonight in Groupil le fol. that cafe with the dark smoky rooms paintings and drawings on every spare inch of wall and squashy couches is one of the reasons i love coming back to Brussels. anyway a busy day of interviews and promo stuff tommorow so i'd better sleep a bit. i have to mention that the first kilkenny vegetarian society no meat and greet was a great success last night! A much greater number of vegans,veggies and curious omnis showed up than we expected ! got to sample some excellent veg homecooking! nice! Well, sitting here in Dublin airport and thanks to a comment from a friendly blogger in the last post I discover that the Disney trailer is on You Tube. Well , if you want to see that version its there on everyones favourite video portal! Gaaah! Just found out the 1st comics are printed and in Paris. Oh man, i wish i had one to take a look at how they turned out. But i have to be patient. They will be available at the Angouleme comics festival. Animation supervisor, Layout poser , plain old Poser , Animator , illustrator, German. well, I thought this year would be a little more settled than last but looking at all the various promo stuff to do in France, Belgium and Ireland it seems more and more likely that I will once again be to Dublin Airport what Tom Hanks was to that other airport in that movie about him being in an airport all the time. sigh. Still its all for a good cause it has to be said. The Dublin launch seems likely to be the Dublin Film Festival screening and I hope it will possible for us to do something in Kilkenny soon after but before the official release. 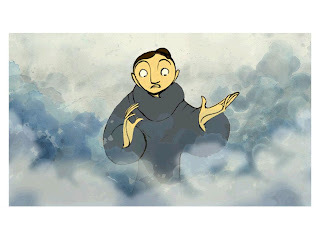 The mad thing is on the day of the release in Ireland (March 6) I will be in Cartoon Movie pitching Song of the Sea. But maybe thats as it should be. Anyway heres a colour rough I made for thr cover of the Aisling comic yesterday. 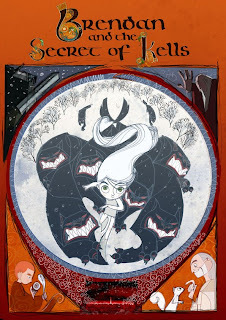 Like the first one its an adaptaion of the second half of the movie using production artwork but with an extra bonus "prequel" about Aisling at the start. Today we went to the premiere of Beverly Hills Chihuahua in Dublin. Disney invited everyone to bring their dogs. That was crazy but the dogs were all very well behaved , we brought little Poppy (our beagle/jack russel cross) and she even seemed to enjoy it. Anyway the trailer for Brendan played as part of the trailers at the start! It was so great to see it advertised like that with all the other Buena Vista releases . Mike McGrath sounded good too I think on the V/O. Well, it seemed to go well, the kids enjoyed it I think. youngsters in the audience afterwards. it was a relief too that even some of the younger kids said they enjoyed the "scary" bits. as usual, i think as adults we underestimated how sharp and on the ball kids are. i had some really intelligent and interesting questions to deal with. Bruno Coulais was there and he was happy with finished product too! the team from digital graphics in liege came down to see it en masse also. it was great to see them all. Fabrice and I gave the making of talk at 6pm and it seemed to go down well too. celluloid dreams have a good strategy in place starting with the premiere in Berlin. we are planning a lot of screenings around france this month too. so a few more interviews today and then off to liege with fabian. Drinking "Barrys" tea with my family here in Paris! had great meal in Le potager du marais - great veggie restaurant. Tommorow morning before the screening meeting with Celluloid Dreams to discuss strategy for international releases ...hold on UK, US and every where else we still hope to get out there after the Irish, French and Belgian release. Ok wish us luck with the screening and making of presentation tommorow! Well, this week I am off to the Paris screening and then up to Liege to work on Song trailer with the fine folks in Digital Graphics. And its a busy old time these next few weeks with screenings in various places, theres the Dublin Film Festival on the 22nd February, and Brussels Anima on the 26th February. Theres is an advance screening in Brussels on the 6th of Feb.
Theres a screening in Berlin near the start of the Festival there also. The other night I met up with Ross Stewart for a quiet one to conspire on our plans for a Kilkenny Branch of the Vegetarian Society (you heard it here first folks!) and who should walk in to Cleeres pub but David O'Reilly. It was great to see him after so many years. But back in the days of yore when we had our studios in Young Irish Filmmakers, David spent a lot of time hanging out with us. He was but a teenager back then but already very good at the old drawing. We chatted a bit about all his hours scanning and inking and painting and even doing a bit of inbetweening and stuff on the original "Rebel" trailer from 2000 . 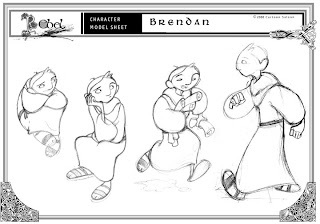 In that incarnation the Brendan character was based on David as you can see from the modelsheets above by Barry Reynolds. Barry also animated a scene of "David-Brendan" with Pangur Ban which is in the "Rebel" promo video too. 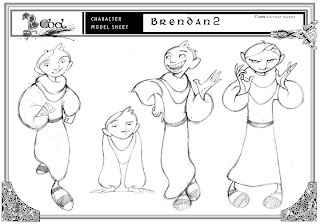 When the film was rewritten in 2003 we started redesigning everything to suit the new story and approach and I post an early concept of this new approach by Ross Stewart above, maybe the last concept we did with the old Brendan design in mind before he got reworked into the final version . Anyway poor David never got credit for all that nasty scanning, inking and painting so I hope this post sorts that out!